Boyds, Md. (November 14, 2018) – A total of 16 Washington Spirit Academy players officially inked their college commitments for the class of 2019 ahead of National Signing Day on Tuesday, Nov. 14. 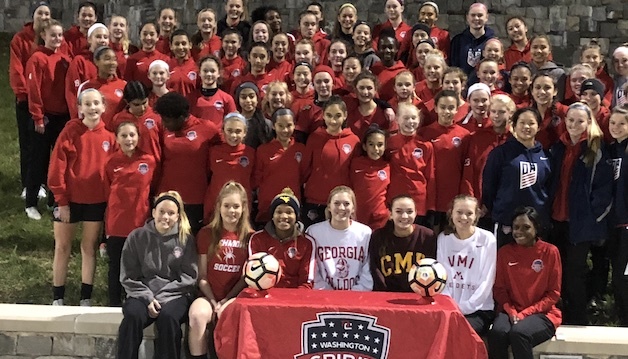 The class of 2019 will mark the second ever graduating class for the Spirit’s U.S. Soccer Girls’ Development Academy programs in Maryland and Virginia. For 2019, Spirit Academy players signed National Letters of Intent for some of the top women’s college soccer programs in the country. Destinations for Spirit Academy class of 2019 players include 2015 NCAA national champion Penn State University (Jordan Canniff), 2016 NCAA runner-up West Virginia University, current No. 20-ranked NC State University (Leyah Hall Robinson), and numerous other high profile programs. Spirit Academy MD’s Jillian Smalls and VA’s Gabby Robinson will go from club-mates to teammates in 2019 at West Virginia University under head coach Nikki Izzo-Brown. “In just under two years of programming this class has represented the Spirit well and we are certain that they will, like last year’s graduates, represent the club, their schools and families on and off the field in the next phase of their journey,” said Spirit Academy – VA director Tom Torres. For a second straight year, a Spirit Academy – MD player has signed with a U.S. service academy, as Laura Wade will play for the Air Force Academy in Colorado. Wade follows in the footsteps of Jillian Gonzales, who committed to Army – West Point in 2018. Spirit Academy – VA’s Maggie Beckman has also signed her NLI to play for a prestigious military college in her home state, the Virginia Military Institute. Congratulations to all the members of our Spirit Academy Class of 2019 on their college commitments!